Colours FM 101.6 Live Streaming Online . 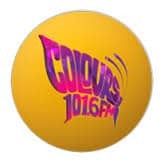 Colours FM is the brand new radio station broadcasting on a frequency of 101.6 . This FM Broadcasts hottest music, gossips, contests and entertainment . Colours FM 101.6 health and lifestyle, beauty, education, fashion, relationships, business, finance, legal and social issues . Listen Over 50 Bangladeshi Radio Stations Live Online . FM will Start Playing automatically .